I’ve come to the realization that our lives don’t seem as epic as they could, with just some very easy fixes. Some quick tips on how to add “Epic!” back into your life. 1) Watch the movie “Epic”. I haven’t actually seen it yet myself, but the name would definitionally bring “epic” into your life. 2) Or read Lord of the Rings, Iliad, Odyssey, or any other epic. Books qualify, after all, and they will guarantee more epic in your life. And that’s about what I have. What do you think? Any brilliant ideas for how to make your life more epic? This entry was posted in list, Webmaster and tagged list, webmaster on March 31, 2014 by Webmaster. I hope you’re having a good day. But I realize that some people don’t always have good days. (In fact, I sometimes don’t have good days- as hard as that might be to believe.) But yeah. On with the post. 2) Talk with a friend. This works for either type of “feeling down”. If you’re looking for feathers, then talking through the merits of the down with a friend can help you save money later on. If, however, you’re feeling emotionally down, friends can sometimes help lift your spirits. 5) Draw a dress. This is one of my go-to’s for when I’m feeling down emotionally. It’s a little creative outlet. It doesn’t require that much time to get something basic, and there are nearly infinite ways to draw one. Do you want the skirt to be twirly? Form-fitting? Rouching on the bodice? Do you want there to be a variety of colors? Single color? The options are endless. And although drawing dresses isn’t productive per say, it’s still more productive than just sitting around feeling glum. So it works. At least for me. What about you? Do you do something in particular when you’re feeling down? This entry was posted in list, Webmaster and tagged list, webmaster on March 30, 2014 by Webmaster. 1) Read (or re-read) all Fluff Posts. That will possible take you a lot of time. After all, there are more than 400 at this point. Way more than 400. And yes, some of them are short. But some of them are lengthier. So, assuming 100 words per post (which is reasonable), you’d have about 40,000 words to read. You know. Not meaning to toot my own horn, but yeah. 2) Get a head start on Christmas Decorating for next year. Start making paper snowflakes now! Or crocheting snowflakes. Or in my case, writing up the snowflake patterns to upload for Christmas season next year. Also, maybe go through and organize your Christmas lights, to make them more manageable for the next year. 3) Read a book. This is always a good default. I recently got “Shakespeare’s Star Wars: The Empire Striketh Back.” I have not finished it yet, but so far I am really enjoying it. I also purchased my own copy of the Prophet of Lamath series- those are also excellent, and highly recommended. 4) Watch a movie. I just saw Sharknado for the first time last night… It was interesting. It was fun watching it with friends, and commenting on some of the improbabilities in the movie, even accepting the “physics” of the show. (Not that there actually were real physics… You know.) But yeah. There are other movies, many of which are good. Court Jester, for example. Or Frozen. 5) Invent something. Please do not then become an evil dictator after your invention becomes popular and gives you the possibility of having all the power in the world. That wouldn’t be very nice. Well, I hope those help you have a good Saturday! Bye! This entry was posted in list, procrastinate, Webmaster and tagged list, procrastinate, webmaster on March 29, 2014 by Webmaster. I recently came across a rather interesting question- if you could move to any alternate universe (not your own), exactly as you are (you do not gain any special powers beyond what you already have), where would you make the most impact? Ooh, fun question! That’s actually a bit difficult. The “impact” aspect is one I hadn’t considered before! I think I would probably want to move to the Eddings universe where The Belgariad took place, I’m not sure I could actually make much of a change there. Or any change, really. Even if I could, I wouldn’t want to. And it would just be so depressing to be so far behind the curve in either any sci-fi or fantasy world. Huh. Fluffy, what about you? I would have to say the universe where Veggie Tales takes place. After all, where else can you destroy an entire universe, just by being yourself? Yes. But it does cause a change. In fact, I think it causes the largest change possible, given my current talents. I, after all, was never particularly adept at handling the magic even on my own world. What about you, readers? What would your answer to this question be? This entry was posted in fluffy, question and tagged Fluffy, question on March 28, 2014 by Fluffy McGiggles. So I was just spending a bit too much time looking at animated gifs of dogs and other cute things, and a couple of the pictures included dogs who couldn’t get up slides. This reminded me of some days when I did nursery work. There was a small little slide there. You know. About the right size for 3-4 year olds to play on safely. And there was this one little boy. He was an absolute sweetheart. He was about three when this incident happened, maybe three-and-a-half. However old he was, like every other kid his age, he had a desire to climb up the slide. It was small enough that I let him try- he was clearly safe. Well, at one point he must have heard that if you get more speed, you can go higher up the slide. So after a few tries of only making it up a few inches, he decided to back up and run. The problem is that there was a step about two feet away from the slide. So when he went back to the base of the step, he got a little bit more height on the slide. Note enough to get up, but enough to see that his idea kinda worked. He then decided to go back even further. He started just a bit beyond the top of the step. (It’s a long step. More like a porch, leading into the Church building. So, there’s also only one step. It’s not like he was running down a staircase or anything.) But yeah. So he started on top of the step, stepped off, and then started to run. There was no real discernible difference. So he went back further. The big issue with the step, though, was that whenever he got to the “step-down” part, he always slowed down, to approximately the same speed. No matter how far back he started, he always made it approximately the same distance up the slide. It was quite amusing to watch, though, and left him more tired out and therefore less restless for story time! It’s definitely one of my favorite memories of being a Church nursery worker. How about you, Fluffsters? Do any of you have any fun “working with kids” memories? This entry was posted in real world, Webmaster and tagged real world, webmaster on March 27, 2014 by Webmaster. So I just realized, it’s been a long time since I last posted a scene from The Lost Prince of Hadenelle. Which is possibly a good thing, since it might mean that I’ve actually had a bit of time recently. Or that there’s extra fluff in the world. You know. But all that to say, Here’s scene 3 from “The Lost Prince of Hadanelle“. Just a reminder, this is all a work in progress. Please don’t steal my work, etc., and please don’t expect this to stay the same between now, and when I finish the story. This entry was posted in Webmaster, writing and tagged webmaster, writing on March 26, 2014 by Webmaster. So, I came across an… interesting… article the other day. Apparently somebody didn’t quite check seller reliability before trying to purchase a gaming system. He didn’t get the system. In revenge, he sent the seller texts. Multiple thousands of texts. Of Shakespeare. I’m not entirely sure whether this really is a “just rewards” situation or not. But really. Receiving twenty-nine thousand texts? That’s impressive. What do you think the proper response should have been? This entry was posted in Webmaster and tagged webmaster on March 25, 2014 by Webmaster. Greetings, readers! I hope your week is starting tolerably. As usual, I visited YouTube last night. YouTube recommended this video for me, and I am confused. I did not realize that there was a proper form to eating this substance called “Ramen noodles”, or that they needed to be slurped in order to be properly enjoyed. I suppose that one can learn something new every day. This entry was posted in fluffy, food, YouTube and tagged Fluffy, food, youtube on March 24, 2014 by Fluffy McGiggles. In honor of it being Sunday, I wanted to share an amusing video with you that I expect many who grew up in a church environment will find amusing. It’s a video called Handmotions in Heaven. Spoiler Basically it’s a song that asks, with handmotions, whether or not there will be handmotions in heaven. But you probably guessed that from the name of the song. The chorus gets a little repetitive, and one of the verses has a little bit of “boy humor” (from my perspective), but verse two is amazing. For those of you not as aware of YouthGroup culture from a while ago, all the words (when he’s in the “evangelization section”) are taken directly from popular praise songs, most of which have the hand motions associated with them that the performers use. End spoilers. Without further ado, here’s the song. Enjoy! This entry was posted in Webmaster, YouTube and tagged webmaster, youtube on March 23, 2014 by Webmaster. I had a fun night last night. 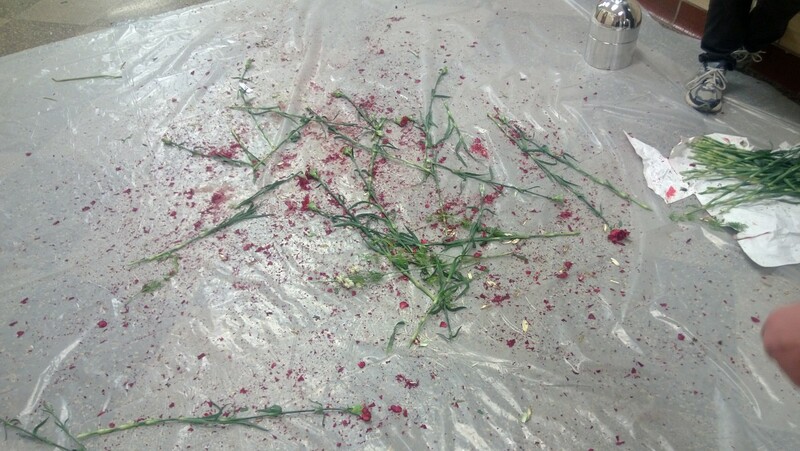 We got to shatter flowers! It was fun. 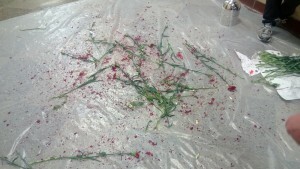 We dipped it in cold liquid stuff, and threw them on the ground, and they shattered. …That would be liquid nitrogen, would it not? That is what it was called! So, did you do anything fun? This entry was posted in real world, Webmaster and tagged real world, webmaster on March 22, 2014 by Webmaster.